I took photos for my friend, whose parents were celebrating their 50th anniversary. I used three cameras for this party (the Nikon D600, Nikon D7000 and Fuji S5 Pro). The cameras are usually not completely synchronized. 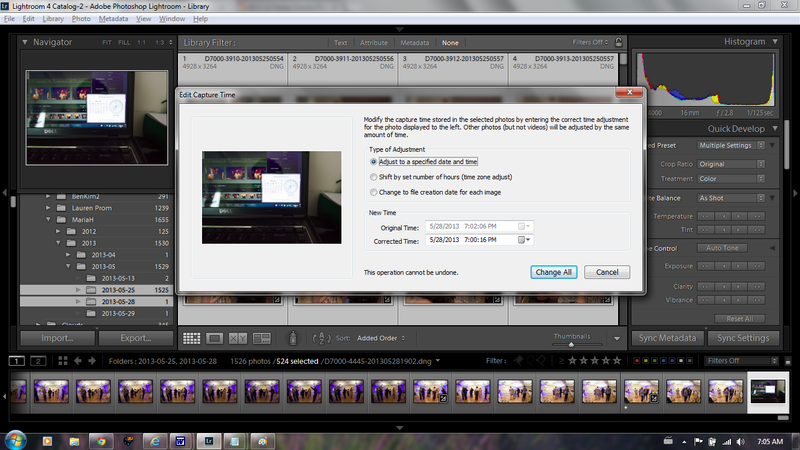 When editing the shots, this can be a headache. Fortunately, synchronizing multiple cameras is easy enough in Lightroom. 1. Take a shot of a clock (such as my computer's clock) with each camera. You can do this before or after taking the photos. You don't even need to do it on the same day, although ideally you would do this before importing the photos. Note the exact time shown on the clock in the clock photo (not the file's timestamp). 2. I import the photos into Lightroom (including the clock photo). a. If you imported the photos together with the clock photo, you just have to select everything that you imported. b. If you imported the photos separately from the clock photo, switch to library view and change the sort method to added order instead of the default capture time. Then you can easily select the photos that belong to a particular camera. Add the clock photo to the selection using ctrl+click. c. You can also use a metadata search to look for the photos from a particular camera. 4. Switch to the Library module. While still keeping the particular camera's photos selected (including the clock photo), highlight the clock photo by clicking on it.